"Hegel, a repulsive, mindless charlatan, an unparalleled scribbler of nonsense." Arthur Schopenhauer. "The real is rational; the rational is real"
Georg Wilhelm Friedrich Hegel (August 27, 1770 – November 14, 1831) was a German philosopher, and a major figure in German Idealism. His historicist and idealist account of reality revolutionized European philosophy and was an important precursor to Continental philosophy and Marxism. Hegel developed a comprehensive philosophical framework, or "system", of absolute idealism to account in an integrated and developmental way for the relation of mind and nature, the subject and object of knowledge, psychology, the state, history, art, religion, and philosophy. In particular, he developed the concept that mind or spirit manifested itself in a set of contradictions and oppositions that it ultimately integrated and united, without eliminating either pole or reducing one to the other. Examples of such contradictions include those between nature and freedom, and between immanence and transcendence. Hegel influenced writers of widely varying positions, including both his admirers and his detractors. Karl Barth compared Hegel to a "Protestant Aquinas". Maurice Merleau-Ponty wrote, "All the great philosophical ideas of the past century—the philosophies of Marx and Nietzsche, phenomenology, German existentialism, and psychoanalysis—had their beginnings in Hegel...". Michel Foucault has contended that contemporary philosophers may be "doomed to find Hegel waiting patiently at the end of whatever road we travel". Hegel's influential conceptions are those of speculative logic or "dialectic", "absolute idealism". They include "Geist" (spirit), negativity, sublation (Aufhebung in German), the "Master/Slave" dialectic, "ethical life" and the importance of history. The German idealism school which developed out of the work of Kant in the 1780s and 1790s and culminated in Georg Wilhelm Friedrich Hegel is considered an important development in philosophy's history by many continental philosophers, but is a relatively minor figure for the work of analytic philosophers. There are views of Hegel's thought as a representation of the summit of early 19th century Germany's movement of philosophical idealism. It would come to have a profound impact on many future philosophical schools, including schools that opposed Hegel's specific dialectical idealism, such as Existentialism, the historical materialism of Karl Marx, historicism, and British Idealism. Hegel's influence was immense both within philosophy and in the other sciences. Throughout the 19th century many chairs of philosophy around Europe were held by Hegelians, although Kierkegaard, Feuerbach, Marx, and Engels were all opposed to the most central themes of Hegel's philosophy. 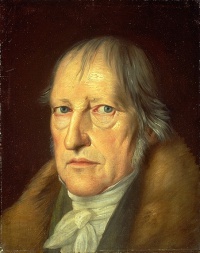 After less than a generation, Hegel's philosophy was suppressed and even banned by the Prussian right-wing, and was firmly rejected by the left-wing in multiple official writings. After the period of Bruno Bauer, Hegel's influence did not make itself felt again until the philosophy of British Idealism and the 20th century Hegelian Neo-Marxism that began with Georg Lukács. The more recent movement of communitarianism has a strong Hegelian influence, although a Hegel specialist would argue that that influence is not strong enough, since communitarianism tends toward relativism, which Hegel's philosophy does not. Unless indicated otherwise, the text in this article is either based on Wikipedia article "Georg Wilhelm Friedrich Hegel" or another language Wikipedia page thereof used under the terms of the GNU Free Documentation License; or on original research by Jahsonic and friends. See Art and Popular Culture's copyright notice. This page was last modified 12:45, 24 December 2015. This page has been accessed 14,981 times.